In the 1975 movie Three Days of the Condor by Sydney Pollack, a CIA operative must piece together parts of a puzzle in order to finally get to a trustworthy circle of allies and solve the mystery. A few years earlier, the Swiss had to do something similar. They had to put together a series of pieces and parts in order to create a reliable motorcycle for their military. It was called the Condor A350. Condor is a Swiss motorcycle manufacturer that has been in business since 1901. Over the course of its existence, it had manufactured its own motors occasionally, but had a long history of utilizing established motors from other manufacturers. Particularly for military contracts. In the postwar period that often meant Ducati engines. In the early 1970s, a new machine was needed by the Swiss military and they once again contracted with Condor. Requirements mandated that the motorcycle must be Swiss made, so logical alternatives from its neighbors such as Italy and Germany were not permissible. Having worked with Ducati on the previous 250cc model, they decided to source the 350cc single that Ducati had used for its previous Scrambler models but was no longer producing. An arrangement was struck for Ducati to produce non-Desmodromic versions of the 350 to provide to Condor. There is some suggestion that only the earliest models were actually made by Ducati at their factory and equipped with Ducati electronics, and that many if not most of the motors from 1974 on were actually built in Spain by Mototrans. In true Swiss fashion, they were able to incorporate some of the best equipment from their neighbors into the Condor A350. A prime example is that the headlight bucket, the headlight, and the switchgear were all BMW/2. They even left the headlight bucket painted black! They also used a BMW exhaust because they wanted the bikes to be relatively quiet. The dual cradle frame was said to be based on a British design. The machine was produced at the plant in Courfaivre in the French portion of Switzerland. It was certainly Swiss made, but Swiss assembled might have been a better term. With that said, they made a number of critical changes and modifications which made the motorcycle suitable for its intended use and more rugged and reliable. They strengthened the kick starter, they coated the exhaust with the white aluminum paint to reduce reflection, they reduced the compression so that it would run on whatever quality of fuel was available. Most importantly, they rubber mounted the entire Ducati engine in the frame. Perhaps to confound the British and the Americans, the gearshift is on the right, the rear brake is on the left, and the gearshift pattern is one up and four down. 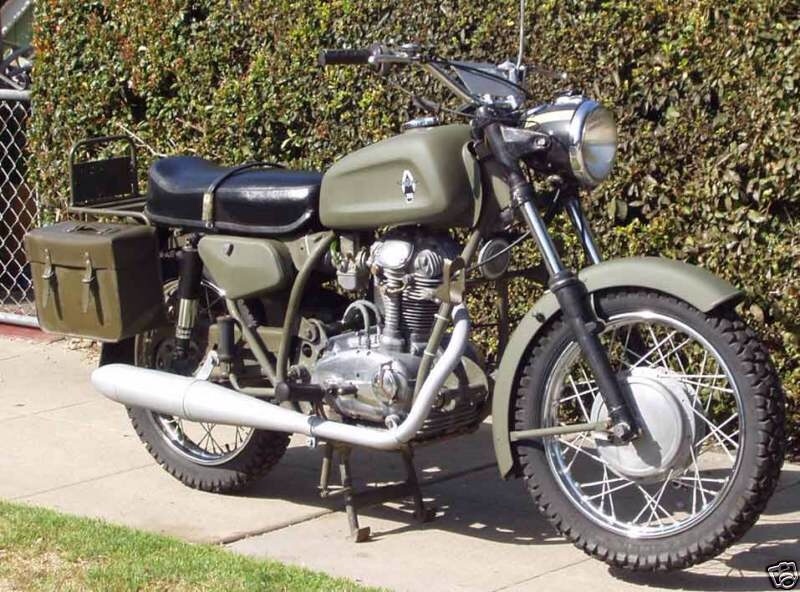 As a military motorcycle, it was assembled for ease of maintenance and use, with a sturdy built-in rack for luggage, rifle mounts, a longer oil fill tube, and a map pocket for the top of the tank. It also has a robust toolkit which includes a sponge, spare bulbs, and the manual in French, German, and Italian. With a five speed gearbox, the result is a superb utilitarian motorcycle ride that can climb mountains in first and get up 120+ kilometers per hour in 5th. About 3000 Condor A350 motorcycles were produced between 1973 and 1978. Many have found their way to other parts of the world. There are thriving clubs in the Netherlands and in Finland, and there are smattering of them in the USA. I can state firsthand that these are fun motorcycles to ride once you get used to where the shift lever is. It moves along pretty well everywhere except the highway, and you often forget that you are riding a single because it is relatively smooth in the frame and has adequate power. 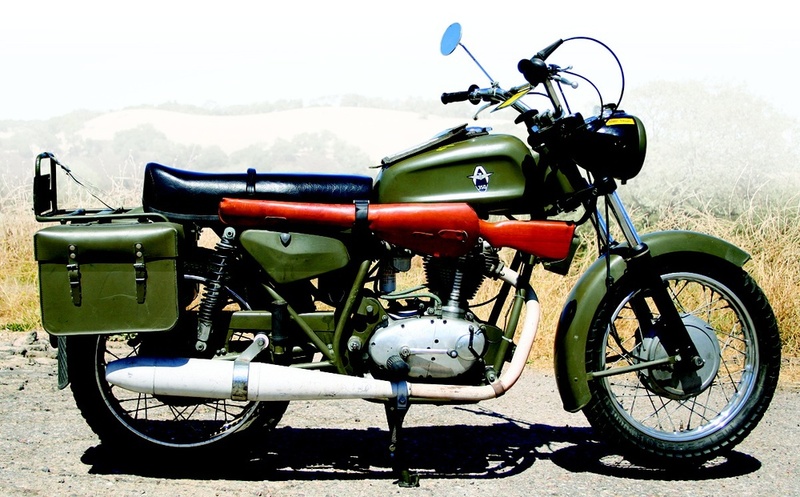 One thing you will not forget though is that you are riding a unique motorcycle which most people have never heard of, and which stands out from the crowd in its' olive drab green livery.